Albert Pujols and Prince Fielder have fled the division. Meanwhile, the Cincinnati Reds kept their marquee first baseman, added a potential ace, and bolstered a bullpen that needed the help. With Joey Votto and Mat Latos leading a talented group of twentysomething blue-chippers, Ryan Madson and Sean Marshall ready to close out games, a premium prospect like Devin Mesoraco poised to crash the lineup, and the rest of the division either potentially weakened (Cardinals, Brewers) or just weak (Pirates, Cubs, Astros), the Reds are being picked by many to win their second NL Central title in three years. It’s a pretty damn defensible pick. As one of the top five hitters in the game, Votto dwarfs the rest of the lineup. There was some speculation that he might be shopped this offseason, with two years left on his contract before free agency (including a $17 million salary next season) and a Reds club that looked several pitchers short of contending for a division title. Credit Walt Jocketty and company for realizing that Votto’s a bargain even at $17 million (let alone the $9.5 million he’s making in 2012), that the division was up for grabs, and that pitching could be acquired cheaply if you’re willing to be patient. Still, it’d be great if Votto had a top-tier running mate, a role Reds fans hope Bruce can fill soon-to-now. And Stubbs, who has some impressive raw tools and a track of converting them into results (37 homers and 70 steals over the past two seasons), seems like another breakout pick. But his strikeout rate reached a career high last year (30.1 percent, second highest among all qualified hitters in 2011), and he’s still not walking enough to be much of an on-base threat. The bonus here is at catcher, where Hanigan wields a .371 career on-base percentage and Mesoraco brings power potential as the heir apparent. The Reds raided their farm system to get Latos, but the move brought a pitcher with an excellent performance record and no notable ballpark splits, despite pitching half his games at Petco Park. Latos’ projection does look optimistic moving to Great American Ball Park’s far more homer-happy confines, but the combination of Latos and Cueto (second-in-the-league 2.31 ERA and a strong 3.45 FIP last year) should match up well with any other top two in the division. Arroyo remains durable but might be near the end of the road after pitching below replacement level last year. Don’t be surprised if the Reds make further upgrades to their rotation, either by winning the Great Roy Oswalt Bluffathon or by doing something at the deadline. As is, grabbing Sean Marshall for a B prospect (microscopic 2.28 and 1.86 FIPs in the past two seasons) and waiting out the market for Ryan Madson (one year, $8.5 million, instead of the $40 million-plus he was reportedly offered by the Phillies at the start of the hot stove season) make Jocketty an early favorite for Executive of the Year. That improved bullpen depth should prove especially useful as Bailey and Leake work on pitching deeper into games. Bruce. How long have we heard about his peak-Adam Dunn power, but with fewer walks and strikeouts and a lot more defense and athleticism? He’s making progress, setting career highs in homers (32) and walk rate (10.7 percent) last year, but there still seems to be something missing. Acknowledging the fickle nature of small sample sizes, it’s still maddening to see Bruce slug 12 homers with an 1.141 OPS like he did last May, only to manage nothing better than an .825 mark in any other month. It might just be a matter of pitch recognition: PITCHf/x highlights Bruce’s success against fastballs, but also his relative struggles against breaking stuff. The guy plays good defense in right, runs the bases well for a big man, and is a better-than-average hitter before his 25th birthday. The best may be yet to come. The Reds vie for their first World Series title in 22 years. No, really. You can go to war with Cueto and Latos at the top of your rotation, one of the best lefty-righty bullpen combos in the game in Marshall and Madson, Votto scaring the bejesus out of even the most dominant pitchers, and a supporting cast that gets better-than-expected results out of Bruce, Stubbs, and the catchers, with Phillips and Rolen holding their own. The rotation is a disaster after the top two, Votto gets little help from his lineup mates, and the Cardinals and Brewers prove more than capable of big seasons even with Pujols and Fielder gone. 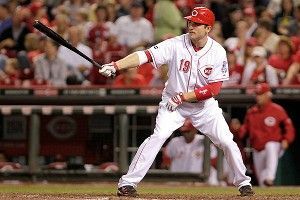 Votto might test free agency after 2013 regardless of how the Reds fare between now and then. A disappointing third-place finish combined with Phillips playing out his option might prompt Cincy to start rebuilding in earnest, and for Votto to be dealt at the end of this season. If that happens, Alex Anthopoulos might resort to Carrie Mathison-like tactics to bring the Toronto boy home.